Abstract: There is a conundrum in the study of comitative constructions in Slavic. It has long been an assumption that the construction is best analyzed through two structurally distinct representations: noun modification by a comitative prepositional phrase and verb modification by a comitative prepo-sitional phrase. Another analysis has been proposed that derives the distinc-tions in the construction not from differential attachment sites but rather via differential movement of comitative phrase and its host. In this view, the comitative phrase always adjoins to the host DP, but is sometimes stranded by movement. This paper presents empirical and theoretical arguments against these analyses using data from Russian. It is shown that both differ-ential attachment site analyses and differential movement analyses cannot account for the construction. This conundrum is avoided by adopting a “de-composed Merge”-style analysis to derive structural ambiguity in the con-struction. Under this analysis the ambiguity is an effect of attachment type, not movement or attachment site. This analysis also provides a new avenue to capture the facts that pertain to plural pronoun comitatives. Russian is the test case here for the sake of concision; however the analysis should extend to the rest of the Slavic languages. Abstract: The aim of this exploratory study is to examine bilingual Russian–Hebrew-speaking children’s performance on the complex Case System in Russian. The speech of six early sequential bilinguals and three simultaneous bilinguals is analyzed for the quality and quantity of errors. Monolin¬gual data came from two sources. The first source was the error rate of case and number by two normally developing monolingual Russian-speaking children, col-lected recently in the former Soviet Union. The second source was qualitative reports on error types made by monolingual children in the course of Case System acquisition. The following research questions were ex¬amined: (i) Are there differences between bilingual children and age-matched monolingual Russian-speaking children in Russian Case System acquisition? (ii) Are there differences between simultaneous and early sequential bilin¬guals in Russian Case System acquisition? Speech of bilingual children was recorded individu-ally and monthly over a seven-month period, 20 minutes per month per child. Error analysis of the bilingual speech was conducted regarding the following target variables: noun oblique cases (Genitive, Da¬tive, Accusative, Instru-mental, and Prepositional), noun number (singular and plural), and the three declensions. The results show quantitative differ¬ences between simultaneous bilinguals, early sequential bilinguals, and mon¬olin¬guals in Russian Case System acquisition. 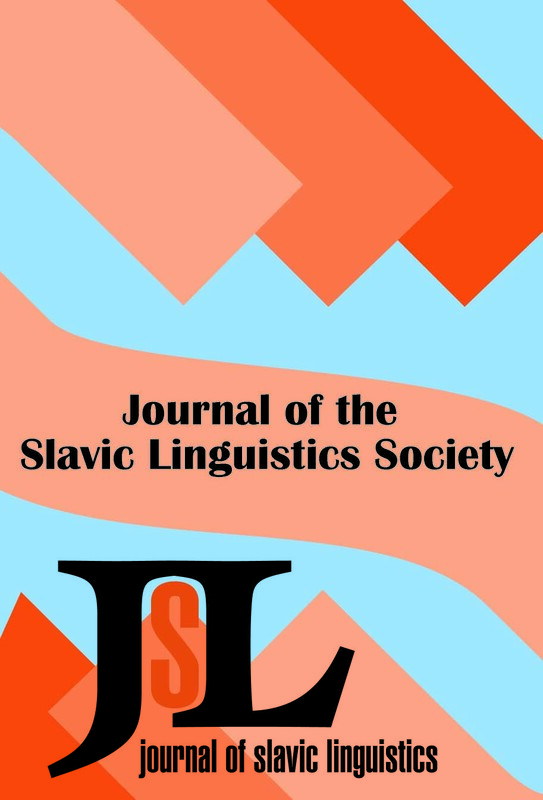 Abstract: This paper provides arguments based on Czech, Polish, Russian, and Serbo-Croatian that distributive universal subjects of negated sentences allow the surface scope interpretation on the order SUBJECT > NEGATION, contrary to Zeijlstra 2004. This observation agrees with theories of negative concord that take negative concord items as universal quantifiers taking scope above sen-tential negation. The arguments are based on available scope interpretations and correlations between word order and scope.